Italy held off a stern challenge in the second half against Canada to win their first 2015 Rugby World Cup match 23-18 at Elland Road in Leeds. Gonzalo Garcia scored Italy’s 50th World Cup try to help drive his country to victory although the result was cruel for the Canadians who lost a similarly tight duel with the same opponents 19-14 in the 2003 World Cup. 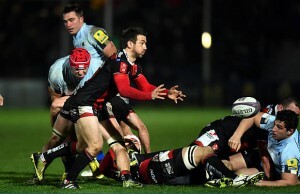 They dominated for long periods and scored the try of the tournament so far through DTH van der Merwe. Italy’s win after a heavy defeat to France in their opener gives them a boost eight days from an intimidating encounter with Six Nations champions Ireland. 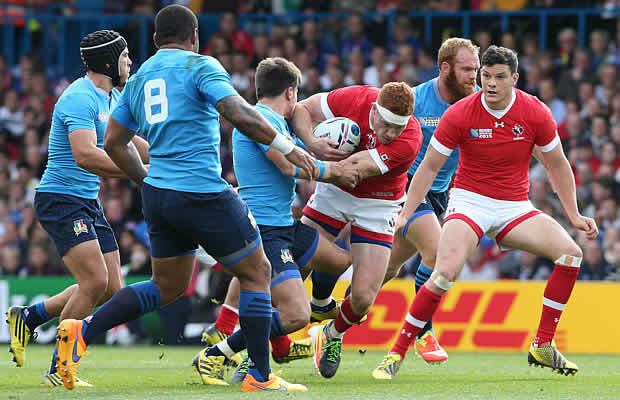 Canada’s sole consolation was a defensive bonus point. Nathan Hirayama gave Canada a deserved lead in the 15th minute with a penalty after the Canadians had threatened the Italian tryline on several occasions in the opening salvoes. A minute later Canada scored the try of the tournament so far, started and finished by van der Merwe, who broke from deep inside his own half down the left wing and passed to Ciaran Heard. Heard sucked in his man and passed back to the onrushing van der Merwe, who had come inside and easily danced round the remaining Italian defender to touch down under the posts. 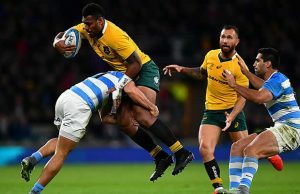 The jolt had the desired effect on a somnolent and indolent Italy, who struck back immediately prompted by a superb solo run from scrum-half Edoardo Gori. He outfoxed John Moonlight and quickly put dayling between himself and the lumbering back row forward before being brought to ground. The chance was not lost as Michele Rizzo went over once the ball had been worked back. Tommaso Allan converted for 10-7 and the former Scotland Under-20 international — who opted for the land of his mother’s birth for senior Test rugby — levelled affairs in the 25th minute with a penalty. Allan had to go off shortly afterwards for a head injury assessment and replaced by Carlo Canna, who put Italy ahead on the stroke of half-time as he converted a penalty for a 13-10 lead. Canada regained the lead early in the second-half with another superb try. Fullback Matt Evans easily handed off centre Tommaso Benvenuti and given a free run at the line by Leonardo Sarto he needed he took the opportunity with aplomb for his eighth Test try. Hiroyama missed the conversion and he was unfortunate not to have a quick opportunity to make up for that after another wonderful passing move by the Canadian backs only for the TMO to rule there had been a forward pass in the move that led to Phil MacKenzie’s try. Italy breathed a sigh of relief. Mauro Bergamasco came on to become the second player to appear at five World Cups — Samoa’s Brian ‘The Chiropractor’ Lima being the other. Italy soon retook the lead. Captain Leonardo Ghiraldini created it sneaking down the blindside from a throw in and when the ball was freed up Garcia was on hand to go over from close range and touch down. Allan back on after his head injury assessment converted for 20-15 but the Italians came under the cosh for the rest of the half. The Canadians were unable to transform their pressure into a try — Hirayama kicking a penalty to leave them just two points in arrears with under 10 minutes remaining. Allan added gloss to the Italian margin by slotting over a penalty in the final minute.